Cousin or real, sisters are a blessing from heaven above. As kids a sister is your partner in crime but as you start exploring this journey called life, she turns into a your real BFF. While growing up, parents teach us the virtue of sharing things with our siblings, although it turned into fight. However, later a sweet memory that you treasure for life. That said, having a sister is best but having someone like Sonam Kapoor as a sister means awesome. It translates into a bigger wardrobe and truck loads of genuine style advice. And after seeing Sonam and Janhvi bond at a recent event, we can say that the later gets lot of her stylespiration from her style maven cousin sister, Sonam Kapoor. So, last night at Zee Cine Awards, Janhvi rocked the red carpet in this ravishing red colour Atelier Zuhara ball room gown. Janhvi's gown featured Atelier Zuhara's classic embellishment of reflective mosaic crystals on top and billowy circumference at the bottom. 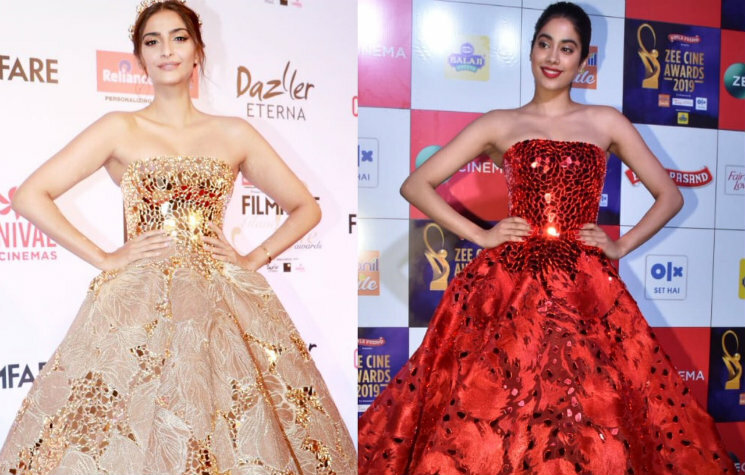 The gown's silhouette that cinched at the waist and yet let Janhvi float down the event, proved that she was not just red carpet ready but also all-dressed to dance feely at a ball. This moment totally brought back the memories of this time when Sonam Kapoor was spotted in the same gown by the same designer but just a different colour.